Pollak's NEW sealed RV socket is designed to be dependable in one of the harshest mounting environments for an electrical device - an exposed external mounting under the rear bumper of a sport utility or pickup truck. This connector design continues to earn the distinction of becoming the industry standard. 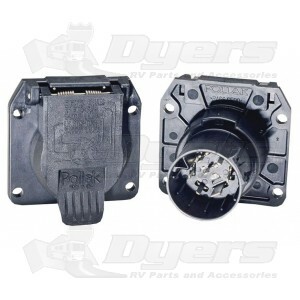 Manufactured from high-impact nylon that solves corrosion problems and eliminates rusting when mated with special interlocking sealed connector. Socket lid features stainless spring and runner gasket to guarantee against moisture intrusion when closed. Socket lid also designed with slot to prevent sand and dirt from impairing closure and lid has wiring diagram on cover to facilitate installation. Socket lid also has a drain slot and is angled down for drainage. Terminal pins are tin plated copper alloy providing higher conductivity and less resistance. Terminal pins are also sealed at the back of socket with silicone sealant to prevent moisture from making contact with mating connector.